This is my third and final of three reviews for the Stage to Screen Blogathon hosted by The Rosebud Cinema and Rachel’s Theater Reviews. You should check out all the great posts for this blogathon listed on their websites. Thanks again for allowing me to participate! Brief Synopsis – After things start to go wrong in the barracks of allied POW’s during WWII, they begin to suspect that they have a Nazi informant among their ranks. My Take on it – As a kid, I had an unusual amount of exposure to this movie because it was my step-father’s favorite movie. In high school, he and his classmates even prepared a play parodying this movie. The script is superb because it is able to take a very serious subject matter and look at it with a lighter tone but still keep the solemn and deadly aspects of the situation alive for us. This movie (along with The Great Escape (1963) a decade later) paved the way for the hit TV series Hogans Heroes to poke fun at life for POW’S in Nazi occupied camps during WWII. Obviously, many people objected to the way both the allied soldiers and Nazi’s are portrayed here, but I actually think that the blend of light humor and serious situations make this one of the very best movies made about POW’s during WWII and one of teh best movies of the 50’s. The many diverse characters on the allied side work well together to give us a wide spectral view of the different kind of personalities thrown together for the war effort. We even get to see one character who’s experience left him very traumatized. The best performance here tho is William Holden who plays the prisoner who everyone suspects is the informant because he trades with the guards to find ways to make money (cigarettes) off the other prisoners. Holden won his sole Oscar for this role and this is by far his best role ever. I’m actually not sold on the fact that this would be a good story to watch on stage as opposed to the screen because the scenes that take place outside of the barracks work well to give us more of an idea as to what is happening. For example just describing the scene of Animal and Shapiro with the paint wouldn’t work as well as seeing it happen. That being said, if I ever get the opportunity to see it on stage, I wont pass it up because this is such a great story. Bottom Line – Amazing movie that tells a great and compelling story and also manages to get us to laugh during situations that are usually only reserved for very serious dramatic storylines. Holden is excellent here and deservingly won an Oscar for his role. Definitely among the best POW themed movies. Highly recommended! Great film for sure. Wish I’d seen the stage play. 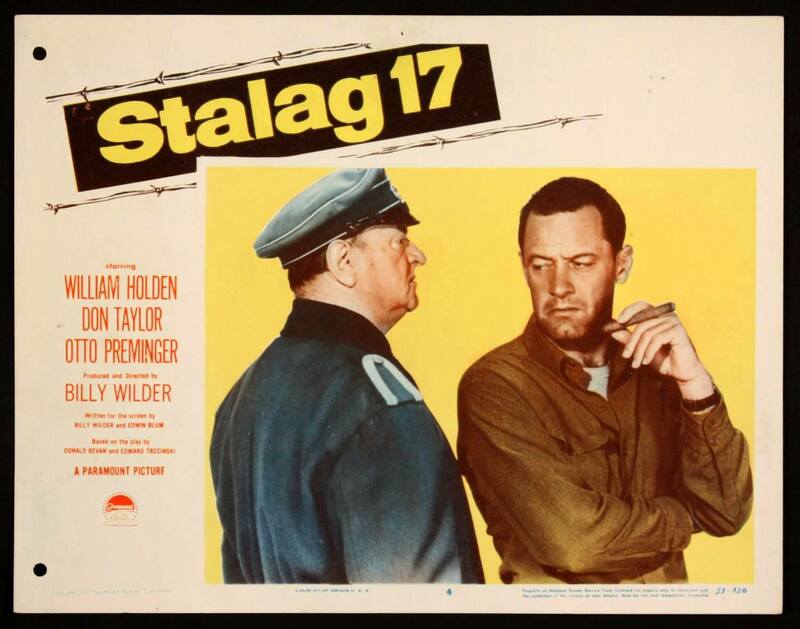 STALAG 17 is one of my favorite Wilder films, and one that gets overlooked, I think. The blending of comedy and drama, as you say, is very well done, and what I also like so much is William Holden’s performance; except for maybe one gesture he makes at the end, he never tries to ingratiate himself with us. I’m also not sure how it would work as a play, though from I understand, they did change the play to put on screen (incidentally, one of the play’s authors is in the movie, as the guy who gets a letter from home and keeps saying, “I believe it”). I love this film, but I too have my misgivings about a stage version, although it’s always hard to imagining anything but the version you love. Surely no-one could be a more perfect Sefton than Holden?